The tongue-in-cheek origin story of hypersparkly, girl-power superheroes. In a rather extended prologue, second-graders Iris, Cheri, Scarlet and Opaline’s sleepover party at the laboratory their mothers work at goes awry when they are splashed by a volatile, mysterious chemical. Shortly after, the foursome is broken apart by parental moves and new schools. Four years later, the group reunites just in time for the chemical’s alterations to their DNA to be made manifest. 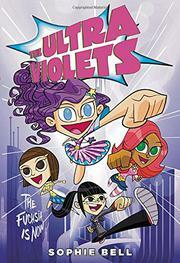 Artistic Iris has grown purple hair and has the ability to change things’ colors; Cheri has super math powers and can telepathically communicate with her beloved animals; tough tomboy Scarlet gains super dance powers. But while her friends bond over trying out their new superpowers, shy Opal feels left out, as her abilities are slow to develop. Meanwhile strange, mutated creatures are attacking the town, and they’re connected to the mysterious “bio-cosmetic” company BeauTek. BeauTek is located in the vacant Mall of No Returns, whose storefronts parody chain stores and feature labs, not merchandise, run by a six-inch-stiletto–wearing madwoman. The main storyline meanders past subplot after subplot, taking far too long to get started. The chatty, pun-filled narration will engage readers but only partially makes up for the padded length. Battle’s illustrations give a cartoony, Powerpuff Girls vibe that meshes perfectly with the voice.